While we were in Man of War Cove we had heard that a few days earlier a hurricane down south was affecting Cabo and a lot of cruisers were waiting for good weather to head down. We too were waiting for the weather. After being at this anchorage for a few days we got the word we could head south so we did. It was Thanksgiving Day. This was the first Thanksgiving in almost 40 years I wouldn't be spending it with my family, and about 12 or 13 for Laura. We knew it would be a long trip. Another overnighter but we were ready for it. As we headed out of Mag Bay we noticed about 5 boats heading south about the same time. They were all heading south together and soon welcomed us into the group. One of the boats "Hooligan" radioed us to tell us that we were heading for a pod of whales. Man, they weren't kidding! We had whales all around us. In fact, a couple were just a little to close for us. One came out of the water and back in right next to the boat. We kept thinking we would hit one. That night we were about 20-25 miles off shore and had pretty rough conditions. It was a long night. The next afternoon we could see lands end. Hallelujah! Oh wait, I'm jumping ahead of myself. Even though we only had about 10 miles to go we still had a couple hours to reach the end, 1-2 to round it and then another getting in to anchor. Oh man, we still had 4-5 hours to go. By the time we got to Cabo Falso that afternoon the winds and seas had picked up so it took us a couple of hours to get around. Ok now, Hallelujah! We made it. Twenty days after leaving San Diego we were in Cabo. We found our spot and dropped the hook. A couple of the boats we sailed with came over to say "Hi". How cool is that? That night Laura and I went to town and had a really good celebration dinner. 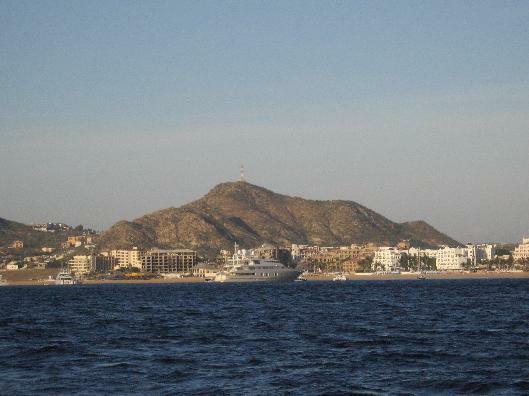 We only stayed in Cabo one more day then headed to Los Frailes. The tourists on jet skis thought all of our boats were an obstacle course and just couldn't stop having so much fun circling and creating wakes all around us. The night before we left we got invited to Mick and Joyces' catamaran "Rhumb Line" along with a few of the boats we sailed with. What a beautiful boat. It was 50' by 30'. Great party!